NEW YORK--(BUSINESS WIRE)--JetBlue (NASDAQ: JBLU) today announced its intent to serve Havana from three U.S. cities, bringing low-cost, high-quality daily service to customers traveling between the U.S. and Cuba for the first time in more than 50 years. The announcement follows the U.S. Department of Transportation’s (DOT) tentative decision to grant JetBlue up to four daily nonstop flights between the U.S. and Havana. “The addition of Havana as our fourth Cuban destination gives JetBlue the opportunity to bring everyday people traveling to and from these cities in Cuba the same low fares and great service that makes our airline the favorite way to fly in the Caribbean,” said Robin Hayes, president and chief executive officer, JetBlue. Havana, the capital of Cuba, is the one of the largest cities in the Caribbean, and one of the most culturally rich urban centers in the world. Home to more than 2 million people, Havana boasts a historic center, which was declared a UNESCO World Heritage Site in 1982, unique architecture and various monuments set against the city’s bustling port on the Caribbean Sea. JetBlue’s focus cities make it uniquely situated to provide scheduled service. Fort Lauderdale-Hollywood and New York City are two of the three largest and most important markets for Cuba air service because of their large Cuban populations and associated familial, cultural and financial travel links. Orlando is the home of major attractions, which are important sites for international visitors and the Orlando area is home to a large number of Cuban-Americans. Each of the U.S. gateways also allow for convenient connecting service from destinations across the JetBlue network. Since starting charter flights to Cuba in 2011, JetBlue has gained valuable operational experience in the island nation and established itself as a trusted, quality carrier with a focus on the customer travel experience. As its presence grows in Cuba, the airline remains committed to supporting local Cuban culture and communities, as well as promoting sustainability initiatives that protect Cuba’s vast and rich natural resources and coastline. Flights between the U.S. and Havana will be operated on JetBlue's Airbus A320 aircraft and A321 aircraft. Both offer the airline’s award-winning service, featuring the most legroom in coach (b); free Fly-Fi, the fastest broadband internet in the sky (c); complimentary and unlimited name-brand snacks and soft drinks; free, live DIRECTV® programming and 100 channels of SiriusXM® radio in every seatback. JetBlue is New York's Hometown Airline™, and a leading carrier in Boston, Fort Lauderdale-Hollywood, Los Angeles (Long Beach), Orlando, and San Juan. JetBlue carries more than 35 million customers a year to 96 cities in the U.S., Caribbean, and Latin America with an average of 925 daily flights. For more information please visit jetblue.com. (b) JetBlue offers the most legroom in coach, based on average fleet-wide seat pitch for U.S. airlines. (c) Fly-Fi is not available on flights operating outside of the continental U.S. For flights originating outside of the continental U.S., Fly-Fi will be available once the aircraft returns to the coverage area. Fly-Fi is available on most JetBlue-operated flights, with fleet-wide installation complete by the end of 2016. 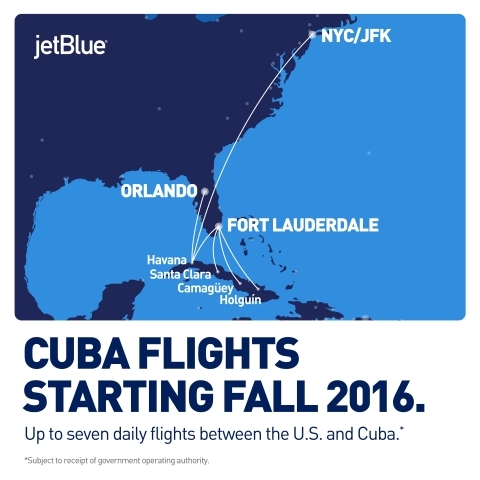 JetBlue today announced its intent to serve Havana from three U.S. cities.